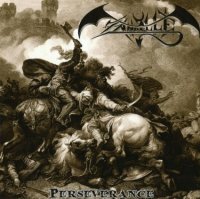 Zandelle may well be an unfamiliar name to some; yet far from being a new band to the scene, they have a history going back almost two decades and 'Perseverance' represents their fifth studio album to date and the follow-up to 2009's 'Flames Of Rage'. The band was formed way back in the mid-nineties by former Gothic Knights vocalist George Tsalikis and have treaded a course incorporating Power Metal with strong Progressive elements drawing on influences such as Helloween and more notably Virgin Steele. Overall 'Perseverance' is decent effort, if not a little derivative of the genre. Everything you expect is there from the bombastic instrumental opener 'Resurgence' to the galloping double-bass drums, scything riffs and furious guitar/keyboard interplay along with the stratospheric vocals that nod in the direction of David DeFeis. There's just an ultimately unsatisfying feeling that each songs drifts by without standing out. Maybe that's down to the rather flat production as certainly some of the instrumentation from keyboardist Josh Tuckman and guitarist T.W Durfy is pretty impressive. Strangely however, the album really picks up towards the end with the title track's uplifting chorus and multiple mood changes along with some strong vocals from Tsalikis and some excellent guitar/keyboard interaction which shows what they can do. Even better is 'Avenger Of The Fallen', a real mid-tempo stomper in the vein of Michael Schenker Group's 'Desert Song'. Again some superb keyboards really add to the atmosphere and the wonderful multi-layered harmony vocals during the chorus really add a touch of class. While the Power Metal/Progressive Metal market place is pretty packed right now with some top class acts, it's doubtful that Zandelle quite have what it takes to break through to the very top. But if they can create more songs in the vein of the title track and the excellent '...Fallen' while also adopting a more punchy production, then there is every chance that they could make some serious inroads into the scene.